With the holidays just around the corner visions of glittering Christmas tree ornaments, shimmering silver tinsel and lacy frost growing on cold windows come to mind. In this spirit this note celebrates the glittering cufflinks of one of the lesser known cufflink makers of the early 20th century. L. Fritzsche "exuberantly geometric" cufflinks, circa 1925. L. Fritzsche & Co. created gold jewelry in the early decades of the 20th century. Based in Newark, New Jersey, the firm was founded by Lebrecht Fritzsche sometime before 1910 and is last mentioned in the trade press in the early 1940s. Beyond that we know little more about Lebrecht Fritzsche and the company he founded ... except for the wonderful cufflinks his firm created during the 1920s and 1930s. Fritzsche cufflinks have an exuberant, inventive sense of geometry. They glitter with playful, myriad motifs arranged in beautifully balanced designs (see above). The cufflinks succeed in being richly detailed without appearing cluttered - they are captivating without being overwhelming. In short, Fritzsche cufflinks exemplify the early Art Deco ideals of rich ornamentation and balanced, orderly design. L. Fritzsche marquise and diamond cufflinks, circa 1925. The production of the Fritzsche firm was limited compared to the more prolific cufflink makers of the period - Wordley, Allsopp & Bliss, Carrington & Co. and Charles Keller. But, like other lesser known "small batch" makers (William Huger Co. and Hans Brassler, from a decade earlier, come to mind), what L. Fritzsche & Company lacked in numbers the firm more than made up for in artistry and design. Fritzsche cufflinks have a unique look, an inescapable beauty that with a little practice is immediately recognized. In a way the scarcity of Fritzsche cufflinks adds to their desirability and charm. L. Fritzsche "Racing Comet" cufflinks, circa 1925. 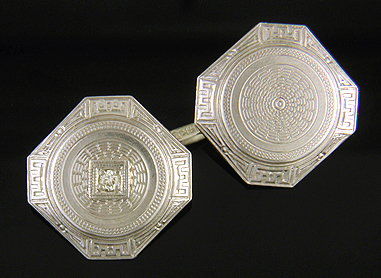 Fritzsche, like other Art Deco cufflink makers, drew inspiration from a number of sources. Fritzsche designs ranged from the abstract and purely geometric to nature-inspired themes rendered in a distinctly Art Deco manner. The Art Deco era was enthralled with speed. Fast cars, record breaking airplane flights and luxurious ocean liners all reflected a passion for acceleration, travel and adventurously challenging the limits. Comets racing in from the far reaches of the universe came to symbolize the frenetic wanderlust of the period. In the above Fritzsche cufflink dazzling diamond-set comets dart across the night sky as stars blur in the background. The comets are rendered in a stylized form that anticipates the Op Art of later decades. 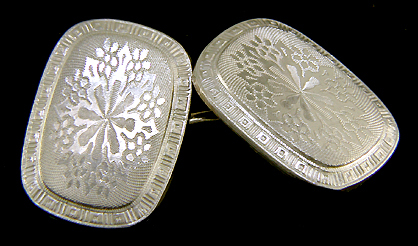 L. Fritzsche foliate and floral cufflinks, circa 1925. 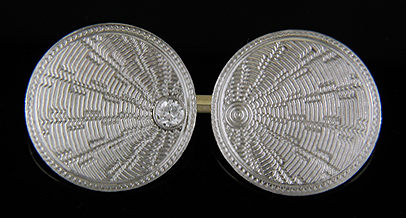 This final pair of Fritzsche cufflinks is an Art Deco interpretation of earlier Edwardian designs. During the Edwardian period (circa 1900 to 1915) jewels often featured beautifully engraved, airy confections of flowers and foliage surrounded by intricate scroll and floral borders. The above Fritzsche cufflink reimagines the earlier Edwardian designs adding a distinctly Art Deco flavor. The floral/foliate design in the center is now stylized and bold, not flowing and lacy, while the delicate borders have been replaced with a primitive geometric pattern that reflects the Art Deco interest in tribal arts and distant cultures. The wonderful thing about antique cufflinks is that the designs from both periods - Edwardian and Art Deco - are equally captivating. to the spirit and joy of the season. Recent additions to the Antique Cufflink Gallery include racing comets and exploding fireworks from the Art Deco era, roaring lions and leopards by Carter, Howe and yachting burgees flying in the breeze.